Kantar has created its first research and development hub in Asia. Called the Kantar Brand Growth Lab, the hub is part of a three-year collaboration with the Singapore Economic Development Board (EDB). It will focus on advanced analytics and harnessing the power of big data, artificial intelligence and machine learning to unlock deep insights that fuel brand growth. The lab is also part of Kantar’s recently launched Analytics Practice, and aims to have a strong innovation mandate. This will culminate in the spearheading of globally significant projects that aim to transform siloed, typically unstructured and un-contextualised data into insights that drive customer-centric decision-making and sustainable growth, the statement added. In addition to the lab’s innovation mandate, the collaboration between Kantar and EDB will also include the hiring of data scientists and business designers. This is in a bid to develop a strong pipeline of Singapore-based talent and expertise in this space. It also seeks to foster Asian-led innovation in creating solutions that will support global clients in growing their brands. Eric Salama, CEO, Kantar, said in a statement that the lab will be an integral part of the company’s mission to unlock the power of this data, and reveal the deeper insights that fuel growth. “Businesses are data-rich but insight-poor. The metrics they measure allow them to drive impact in the short-term, but fail to provide the holistic understanding that can effectively direct long-term strategy,” Salama added. 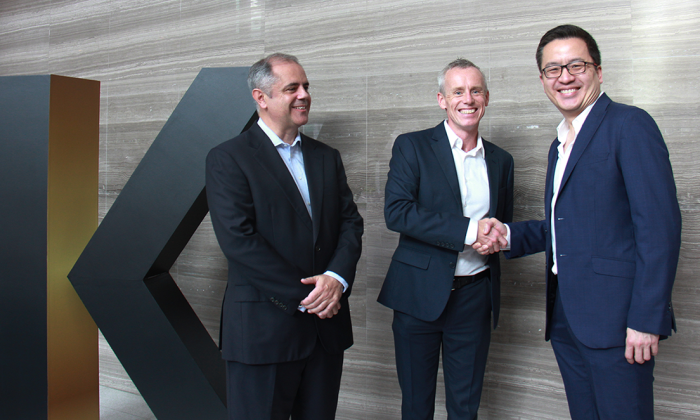 Tim Kelsall (pictured centre), chief client officer at Kantar in APAC added that the launch of Brand Growth Lab in Singapore highlights the strategic importance of the country as a base for developing world-class services that can be exported regionally. “We are delighted that Kantar has chosen Singapore to locate its first advanced analytics hub in Asia. Singapore’s professional services sector is growing, and Kantar’s decision is testament to this,” Kelvin Wong (pictured far right), assistant managing director, EDB, said. Most recently, EDB partnered Nielsen to launch the Singapore-based Neuro Lab which aims enable clients to optimise the effectiveness of advertising in video, print and digital spend, packaging, and in-store elements, among others. It also signed a partnership with CapitaLand worth SG$10million last year to upskill CapitaLand’s staff in areas such as digital marketing, data analytics and digital product management. WWF-Hong Kong has called on Hongkongers to literally “rewrite the future” of elephants by encouraging them to create a new Chinese..